This is my second sewing machine, a Janome New Home 663. It came to me through FreeCycle, just like the last one. The difference, of course, is that this one works properly. Sadly, its functions are very limited. It can do a straight stitch and a Christmas tree stitch. 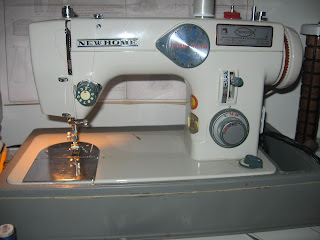 It should have pattern cams to enable it to do more things, but they had been lost by the time I got the machine, and I haven't found any on eBay or anywhere else on the web. I like this machine a lot--it's a workhorse. It can sew through multiple layers of denim, which was very handy for sewing jeans. It does have a bit of what I call an attitude problem, meaning that sometimes it just won't sew properly, and I haven't ever been able to figure out any rhyme or reason to when it will and won't sew. Luckily it works most of the time, and when it doesn't, I find the best cure is simply to leave it alone for an hour or two. In case you're wondering, the machine was threaded with nylon thread when I took a picture of it. I had been sewing white tulle, and I thought nylon thread would be better than white. What was that about the best laid plans?